Schumer had been blocking a confirmation vote on Ronald Batory since August, when the Senate Commerce Committee unanimously approved him to be Federal Railroad Administrator. Schumer was demanding $5.5 billion for a major New York infrastructure project in return for letting Batory through. Republican senator John Thune (S.D. ), who heads the committee, had slammed Schumer on the Senate floor for "playing political games" with rail safety. The behind-the-scenes machinations that ultimately led to Schumer's decision to end his obstruction began two Sundays ago when an Amtrak train collided with a freight train in South Carolina, killing two and sending nearly a hundred to the hospital, according to a Senate aide familiar with the confirmation negotiations. "After the South Carolina Amtrak accident Thune came back to Washington very upset at the series of passenger rail accidents where there have been deaths and injuries," the aide explained. "Thune was ready to go again to the Senate floor to see if anyone was going to step up in these circumstances and object to confirming Batory like they did in December, but before he did that he reached out to Schumer." "We need to get somebody at this agency," Thune told Schumer last Wednesday, according to the aide. "Because otherwise I'm going to the Senate floor to do this again." "It was not a transactional conversation," the aide said. "The only thing Schumer asked for was time and for Thune to hold off on going to the Senate floor." A spokesperson for the Department of Transportation told the Washington Free Beacon "zero concessions" were made to Schumer by the agency in return for his acquiescence on Batory. Schumer's office did not respond to questions on his decision-making process on the Batory confirmation vote. He is yet to comment on the vote. Thune celebrated the Batory confirmation as a "win for railroad safety." "Even as his confirmation languished, consensus that Ronald Batory was highly qualified to serve as administrator of the Federal Railroad Administration never waned," Thune said in a statement. "His confirmation is a win for railroad safety and I expect him to have an impact." Sen. Kirsten Gillibrand (D, N.Y.), who privately accused Transportation Secretary Elaine Chao of "killing people" by not guaranteeing funding for the multibillion-dollar tunnel project, also did not respond to a request for comment on Batory's nomination. 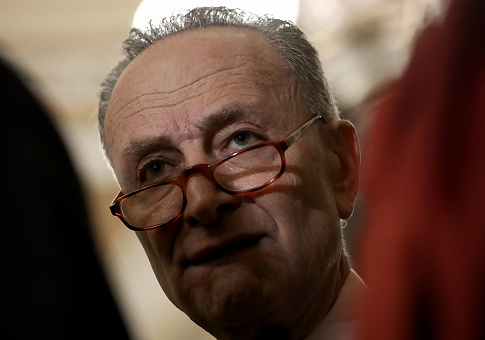 New Jersey senators Cory Booker (D.) and Bob Menendez (D.), also pushing for funding for the tunnel, were supportive of Schumer's block on Batory as recently as last Friday. This entry was posted in Politics and tagged Chuck Schumer, Department of Transportation, Senate Democrats. Bookmark the permalink.